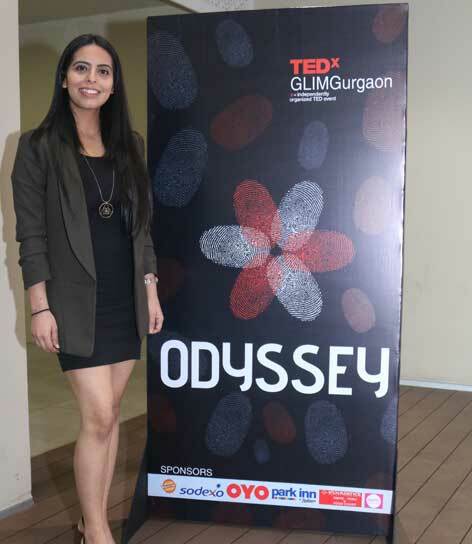 Gurgaon: In order to spread the message that disability can’t stop a person from achieving one’s dream, Miss Deaf Asia 2018, Nishtha Dudeja, spoke at the 2nd edition of TEDxGLIMGurgaon. The event was hosted by Great Lakes Institute of Management, Gurgaon at their premises. The theme of this edition was ‘Odyssey’, which represents the journey that millions undergo each day, every year and at various stages in their lives. Nishtha’s shared her views on “A different TED Talk: The Sound of Victory”. It emphasized on her life journey from a girl who once couldn’t hear and speak, to a commerce graduate, a sports person and then to Miss Deaf Asia. This edition of Tedx brought personalities from different backgrounds and industries to share their experiences through the story of their lives, such as Nidhi Goyal, the first Indian female blind standup comic, Anmol Rodriguez, an acid survivor & social worker, Lt Cdr Pratibha Jamwal of Indian Navy who sailed across the Globe, Dr. Hosne Ara Begum, a social worker, Prof. Umashankar Venkatesh, an educationist and Riya Jain, a Fashion Blogger. Nishtha Dudeja recently won Miss Deaf Asia 2018 title at the 18th edition of Miss and Mister Deaf World -Europe -Asia Beauty Pageant at Prague, Czech Republic. She is the first Indian to have won any title at Miss Deaf World Pageant. She is a National Award winner for the Empowerment of Persons with Disabilities under the category – Role Model.